What does it do? : if your hair is over processed and you find it can be stringy the Rebond will help build up the nutrients in your hair to bring it back to a much healthier state and will strengthen the hair shaft to no longer have that stringy texture. How does it work? : The first step is the Rebond shampoo and you use it like every other shampoo, wash and rinse. Step two is the treatment. Apply the product to your hair and massage it in. Leave it in for 5 minutes when in the shower. Once the time is up do not rinse! Go straight in with the step three conditioner. The treatment and conditioner work together so if you do rinse it out the treament you will only be getting 50% of its benefits. Only leave the conditioner on for a few seconds before rinsing out everything. You can use the shampoo and conditioner every time you need to wash your hair but only use the treatment once a week. Using the treatment too often can over work your hair. What’s the difference between the Rebond treatment and Bond step 3 and which is best for you? : The difference is the Bond treatment is for damaged hair from the sun, heat, or colour. The Rebond is for very damaged and thick, coarse hair. If you have thin, fine hair and you feel like the ends are brittle the Bond is the best treatment for you because it wont overwork your hair. If you’re blonde and have a lot of damage, or have thick hair with damage the Rebond would be best. The product is thick so it won’t weigh down your hair, but if you have fine hair it will seem heavy. 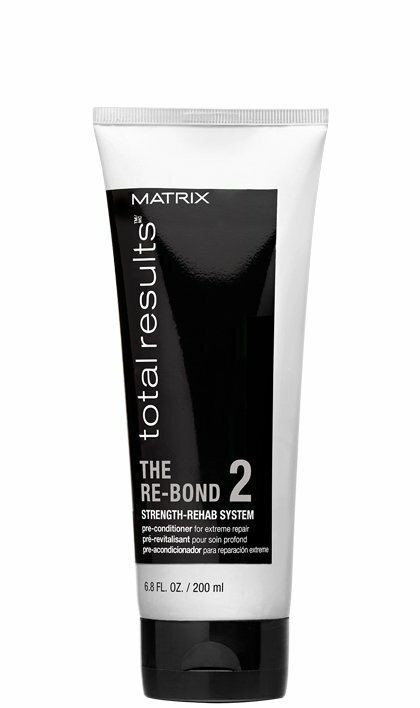 Next time you’re in at the salon talk to your stylist if the Rebond is best for you!